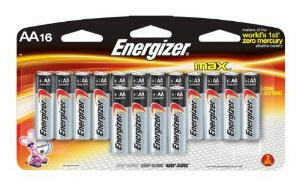 Energizer Max Batteries, premium alkaline AA, 16 Pack - Made in the USA, and designed for long-lasting performance in the broadest range of device application. With no added mercury means Energizer Max is an environmentally responsible battery that can be disposed of with regular household trash. Great/reliable portable power that maximizes fun, productivity and safety.